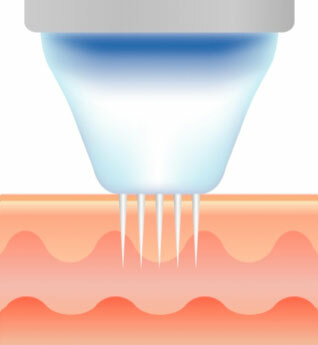 The Micro-needle Cartridge is placed on the surface of the skin. The Micro-needles penetrate through the surface of the skin. Bipolar RF energy is directly applied to the target area. This stimulates Collagen regeneration and new elastic production processes begin. How does the RF Aesthetics ‘Secret’ work? Fractional lasers penetrate the skin causing an inverse triangle of damage to the epidermis. The deeper the target area the more extensive the damage. But the RF Aesthetics ‘Secret’ delivers precisely controlled RF energy only to the target areas, adjusting the depth selectively with minimally invasive micro-needles. This means minimal damage to the skin epidermis, shorter treatment times and less pain with faster recovery times.